Another addition to the downtown Las Vegas scene is the small restaurant, Le Thai. Don’t expect Thai food like what you get at Vegas’ famous Lotus of Siam, but what Le Thai lacks in spice, it makes up for in style. The restaurant is small with a glassed-in kitchen to the left, a bar to the right and a few tables in the main room. Further out back are several more tables and a long counter which is where we had our lunch. There is an $8.95 set lunch menu served Monday to Saturday with a selection of dishes from the main menu mostly curries and stir-fries which come with soda. From the main menu, there are several more dishes from appetizers, soups, salads and noodle dishes that are also larger in portion than the lunch menu and can be shared family-style. My sisters opted for the lunch menu – the pork Pad Prik (spicy red curry based dry stir-fry) for one and the minced chicken Ga Pow (basil, chili, garlic stir fry) for the other. My mom and my sister’s MIL shared the lunch bowl of vegetable stir-fry with shrimp. I opted for a non-lunch menu dish – Thai pork jerky for all of us to share plus the Thai beef fried rice and aside order of cucumber salad. Spice levels are from 1-5, my sisters chose 2 and so did I. The food came quickly – large steaming bowls of goodness. The fried rice had that smoky wok flavor complemented by the fresh cilantro and the pork jerky was hot and crispy and came with the standard sticky rice to make bites with the pork and fish sauce dip. The food was good but I wish I had asked for a notch up in spice level as my fried rice was more sweet than spicy. Next time I’m going for level 4. 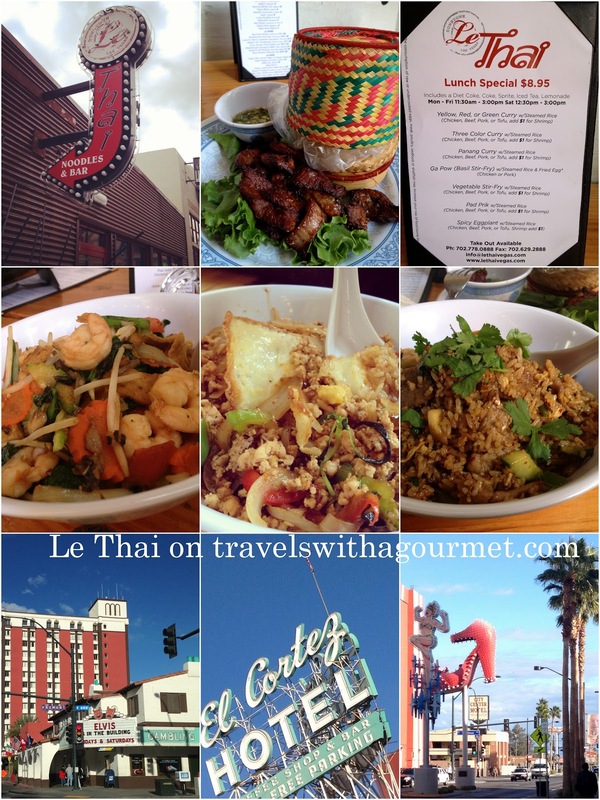 Hopefully, the next time I’m in Vegas, there’ll be a few more additions to the downtown dining scene but for now, Le Thai is where to go for a quick satisfying bowl of Thai goodness. *Open Mondays to Saturdays from 11:30 straight till midnight. Closed on Sundays.